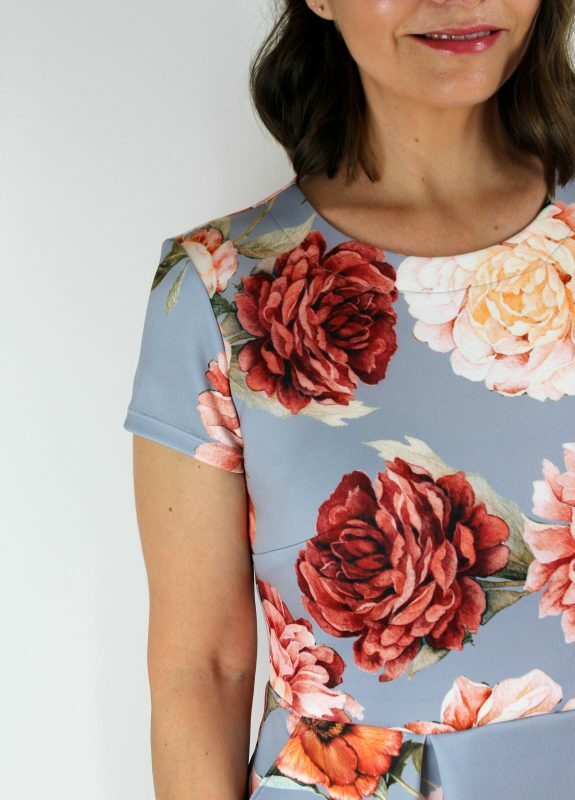 Hi everyone, it’s Kathy here again, and for this blog post I am really excited to share with you a recent PDF dress pattern discovery from the German company Pattydoo. For this dress I knew that I wanted to use one of the pretty scuba fabrics which Sewisfaction are stocking and when I travelled down to Wokingham last week to meet up at the shop with Sheona and some of the other lovely girls from the Sewisfaction Blogger Team I could not resist this stunning Camelia Embers scuba. There were other fabric purchases made on the day, but no doubt you will hear about them from me another time! The scuba is super soft and has a gentle stretch with good recovery, so I thought it would be great for this dress. 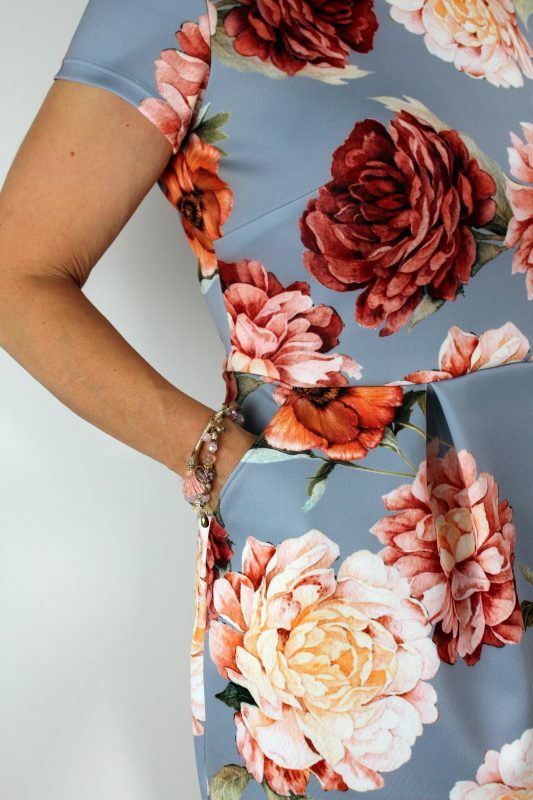 Dramatic large flowers are set against a pretty soft blue/grey background which makes it feminine and very wearable. 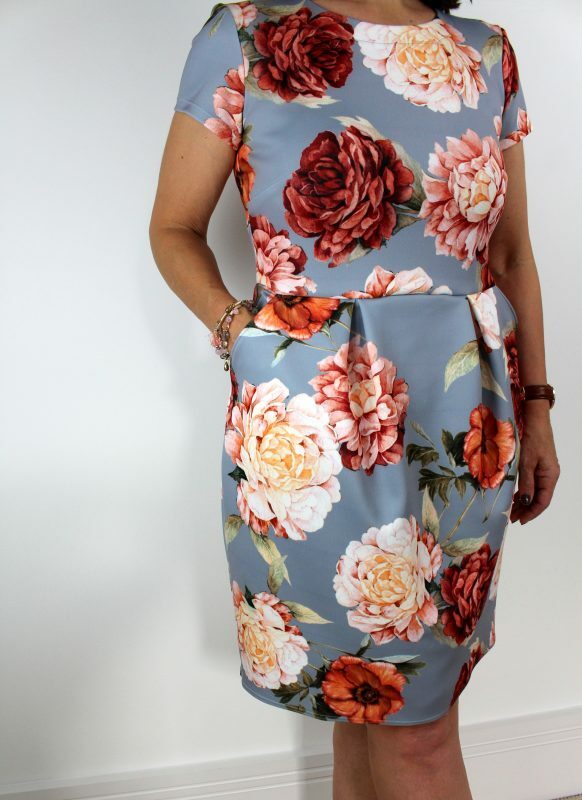 It’s lovely and wide too – 145cm – so for this dress I only needed 1.5 metres of fabric. I wanted a medium weight fabric in order to really show off the stunning inverted pleats on the skirt of the dress which give it such a great tulip shape. Back to the pattern. It’s the Chloe dress from Pattydoo. There are pro’s and con’s with this one. Firstly, and you might want to be sitting down when I tell you, this PDF cost me 2.99 Euros. Yep 3 little Euros which works out at about £2.68 according to google! The down side to this, for me at least, is that it is a German pattern company, and therefore it is entirely worded in German. I do not speak German unfortunately! Eventually with a great deal of help from Google Translate, I was able to gain a little understanding on what was written! It’s a knit dress pattern and as mentioned has a gorgeous tulip skirt detail, formed by the creation of 2 inverted pleats. It has side slanting pockets, the choice of short or long sleeves, a neckband or neck facing option and the choice to make it into a skirt only. Pretty good value I think! 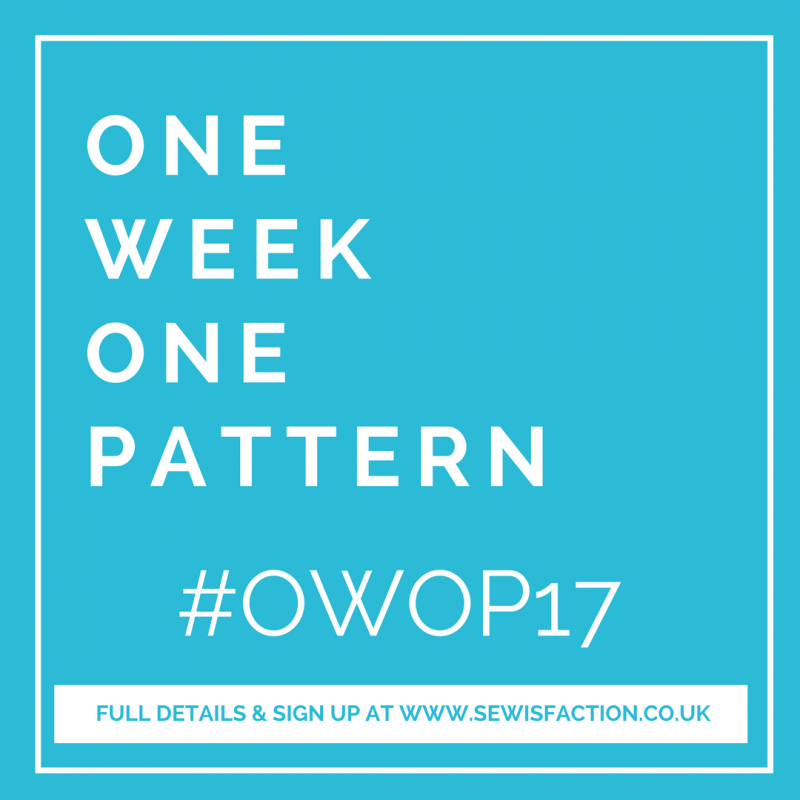 Thinking about it, with all those options, this could be a really good example of a pattern that would work really well with the #OWOP17 challenge. If you haven’t heard about this friendly sewing challenge which is taking place at the end of November, you will find a blog post all about it here on the Sewisfaction Blog as Sheona is hosting this year’s event. The PDF printed out perfectly (at home), and was easy to assemble. No problems with the scale or sizing of my pattern pieces. The pattern includes good instructions regarding sizing, body measurements, fabric requirements, sizing alterations advice and cutting layout. The actual sewing instructions however, are to be found on the Pattydoo YouTube channel. You need to search ‘sweatkleid chloe’ and you can follow along. Although it is spoken in German, this visual presentation is really easy to understand and actually a great way to demonstrate sewing instructions. The video shows how to make the childs version of the dress, and for the adult version there are separate written instructions within your PDF to show you how to sew the additional darts, neckband options and gathering at the back waist seam. It might be worth mentioning that I used ball point needles throughout this project and also used ball point pins too. I used a combination of both my regular sewing machine and overlocker, and was pleased at just how quickly it came together. The back of the dress is shaped by the addition of a piece of elastic which is stretched along the waist seam. I’m not altogether sure I’m that keen on the look of this and may replace this feature with darts/pleats for future makes. The length of the dress is only just knee length on me ( I’m 5’2”), despite adding 2cm to the length of the skirt for this make. Next time I will add a little more on the skirt length I think. 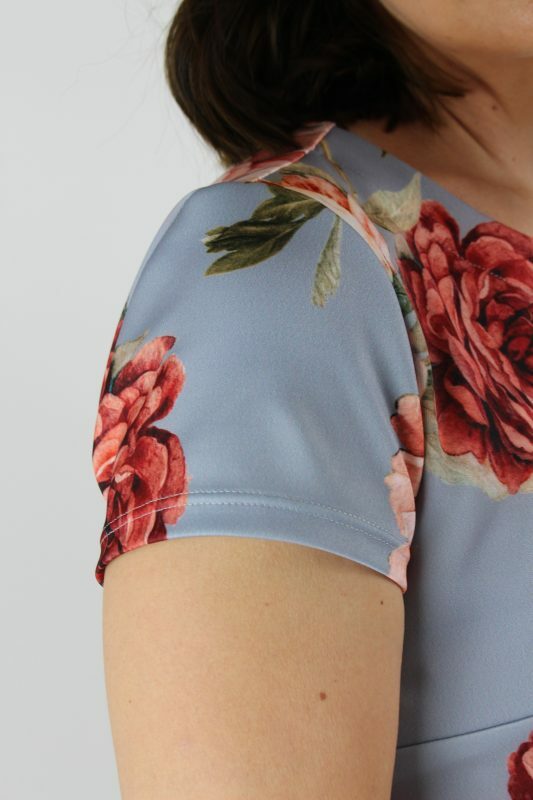 The hem along with the sleeves are finished with a twin needle, which always gives a lovely finish to any knit project. I really am in love with this dress. I finished it on Saturday, my husband took my photos, and I wore it out on the Sunday to a family get-together! It’s a bold claim but I really do think this is my most favourite dress pattern. I have been looking for a sewing pattern for a knit dress with a tulip skirt for so long and this is perfect. I think the long sleeved version in a French Terry or sweatshirting fabric, with a contrasting neck band would be super cute for Winter too. Expect to see many more of these dresses from me in the future! I really like your dress and the colors of it. I don’t know if I could deal with the German though. My daughter studied German throughout high school, so maybe she could help. Or…. I could muddle through Google translate. In any event, lovely dress! This looks lovely! The fabric works perfectly for that pattern.